Your job stuck? 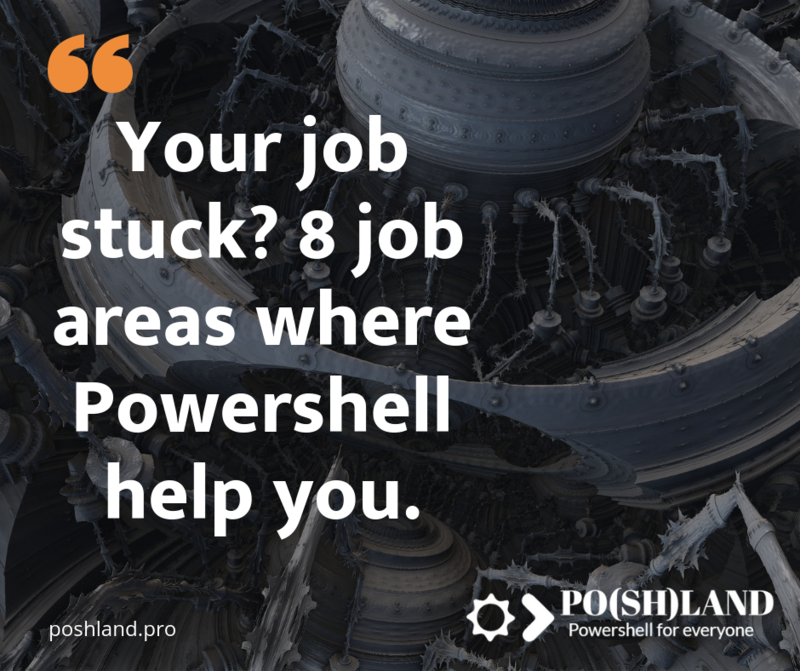 Eight job areas where Powershell help. We are doing tasks everywhere, in our workplace and house. Recently, productivity is very popular. I love increasing my productivity. People want to do more job at the same time. A day has only 24 hours. I want to list eight job areas, where Powershell automation will help to save your time. Powershell is identified as a useful tool for IT Administrators. Almost all IT administration processes can be done from the Powershell console. Administrators are using Powershell scripts to save time. Do you think that Powershell is only for technical geeks or programmers? I don’t think so. Do you know the MS Excel application? It’s a great application, where you can automate calculating data and create reports much faster than calculate it manually. In my opinion, Powershell is very similar to Excel. When you invest your time to prepare Powershell automation, then you save time. I will list and describe examples which can help to automate your tasks on your workstation. Does your drive contain thousands of files? Every week you are creating a hundred new files in your job, and you can’t control them. Do you have many files in the “Downloads” directory, or you are a photographer and your photos are everywhere on your drive. You are an organized person and have a dedicated a folder for each project. All of these projects contains folders structure based on project type. Always when the new project starts, you have to create all folders and share them with co-workers? It’s time to automate it. You can do this with Powershell help. If your manager or team needs to be immediately informed about created or modified project files, probably, you can create an automatic notification with Powershell. Sometimes, I think that with Powershell sky is the limit. Truer is that the REST API or other application interface is the limit. If you get access to the system with Powershell help, you can do almost everything. Probably, every day, every week or every month you have to prepare reports for your Manager. Are you making these reports every time in the same way? Stop do this!!! It’s time to check if Powershell can access to source data and automate these tasks. Do you love to know about your work statistics? All customers or business partner love to be served quickly. How to improve customer service in a small business without the CRM system. Maybe you want to prepare statistics of your email responses. It really helps measure the customer service level. Prepare scripts and count this with Powershell. Are you doing many repetitive tasks in company applications and think that it’s waste your time? A lot of systems have the REST API. Powershell is one of the best ways to get access to the applications through API. Try Invoke-RestMethod command to get access to these applications. After getting into the system, you can create automation of your tasks. Powershell help you. You want to back up your files and copy them to cloud storage? No problem. You can start writing your script just now. Some business processes are based on emails communications. You have to read all emails body and count some of the included data in these emails? Maybe you have to save all attachments in a folder shared for co-workers? Often it’s not a problem. I have the ready example for you: Powershell Automation in Outlook probably you have never seen. Sometimes we are working with many customers using different applications to project and task management. Don’t waste time to copy data between your systems and customers systems. Powershell will help automate this process. I know that now are many available SaaS application to automate our job. I can list a few of them, like Zapier, IFTTT, Microsoft Flow. You don’t have to learn to code because you can create workflows in a web interface. The problem appears when one of these apps don’t contain a required connector or template to prepare automation. Sometimes you don’t want to add your credentials in this apps because you don’t trust them? What if your company or customers do not allow you to use them worrying about the company data? What next? It depends on your position. If you are an employee, you can automate your job and save your time, tell about it your employer and get promoted at work. If you are a small business owner, you have to calculate the profitability. You can learn Powershell, onboarding Powershell expert or outsource task automation for the freelancer. What is your experience with job automation? Please leave the comment. « Previous Post Poshland Blog is not only for Windows Users? Powershell Core. Next Post » How applications integration through Powershell will help you automate your jobs.